You’ll never want to go back to whatever it was you were eating before. Everyone knows that grilling is the best summer food pastime, but don’t limit yourself to just burgers and hot dogs. Everything tastes better on the grill, including vegetables (some surprising foods you should grill). The best part about cooking on an open flame is the nice smoky finish that adds a depth of flavor to any food. This salad features, arguably, the two best foods of summer—juicy, ruby red cherry tomatoes and sweet summer corn. And mixing those two with grilled whole romaine and topping the whole thing off with a creamy avocado dressing will change the way you look at salad forever. Heat a grill or oven burner to medium-high heat. Place shucked corn directly on the grill or lay flat on the oven burner. Once kernels are evenly charred (but not burnt), turn the ear of corn. Repeat this process until both ears are charred (about 10 to 12 minutes). Set aside to cool. 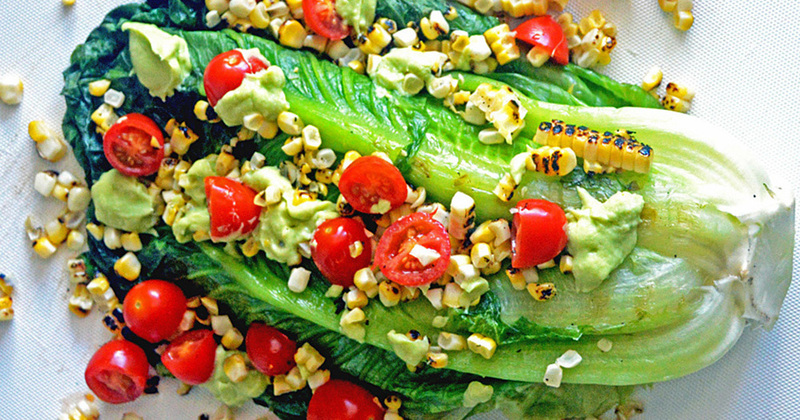 Place lettuce on the grill (or grill pan in the oven) and char the outside (about 1 minute on each side). Set aside to cool. While corn and lettuce cool, make the dressing. Add avocado, lime juice, salt, yogurt, oil, and garlic to a food processor, and blend until smooth. Once the corn is cool enough to touch, cut kernels from the ear. Combine corn with cherry tomatoes and toss with dressing (or dollop dressing on at the end to control the amount). Place corn and tomato mixture on top of the lettuce and enjoy.